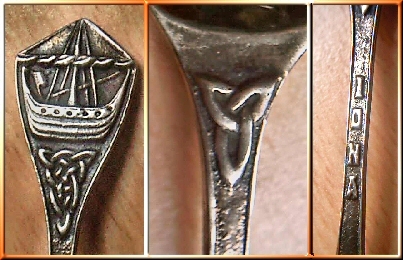 Detail from an Alexander Ritchie silver spoon, showing a Viking ship with furled sail, typical of designs found on medieval Iona gravestones. 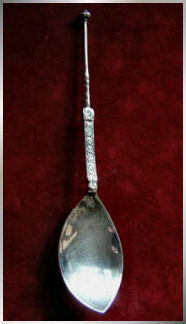 The spoon is hallmarked for Glasgow 1932, with the usual additional AR and Iona markings. 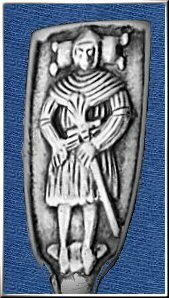 Detail from a very rare early Ritchie silver spoon hallmarked Chester 1907, showing medieval Highland chieftain on the handle (the design taken from an Iona burial stone), and an Iona dove in repousse on the bowl. 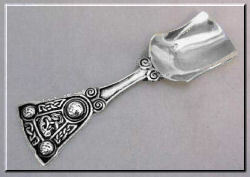 1934 Glasgow silver spoon by Alexander Ritchie. Unusual silver fork by Alec Ritchie, a facsimile of a medieval fork unearthed during the renovation of the Iona Nunnery buildings. This one hallmarked Birmingham, 1935. 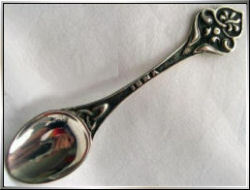 Fine Alexander Ritchie spoon with IONA embossed on the front of the stem, and typical foliate decoration. Hallmarks are for Birmingham 1936, with the standard AR and ICA marks shown on the reverse. Photo courtesy Carey Hill. 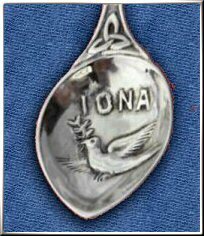 Rare Iona Nunnery spoon facsimile. A few of these were produced by Alexander Ritchie from exact details of a medieval sliver-gilt spoon excavated in the Nunnery grounds in 1923. As Ritchie was well-established on the island by this time, he was able to see the original and produce his own mould for specialised reproductions. 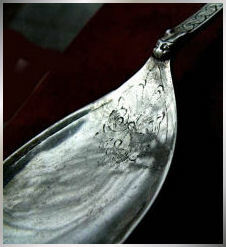 The bowl of the spoon has a lightly-engraved medieval floral line-patterning. This one is 8" (20cms) long and has marks AR IONA and a Glasgow hallmark for 1930. 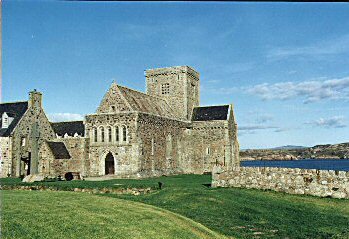 The original medieval spoon found on Iona is in The National Museum of Scotland. Silver Alexander Ritchie spoon with pierced Viking ship and foliate decoration just above the bowl. A fine piece, hallmarked for Birmingham 1936 with AR IONA and ICA. Length approx. 4". Silver Alexander Ritchie spoon with knotwork, spirals, and zoomorphic decoration. Marks are AR IONA and ICA with Birmingham hallmark for 1936.